Somedays You Just Don't Feel Like Learning How To Walk. And That's Ok.
You are here: Home / Parenting / Somedays You Just Don’t Feel Like Learning How To Walk. And That’s Ok.
Whoever said that all children with Down syndrome are angels that obey every wish of their parents (or their physical therapist) while smiling and hugging them all at the same time, clearly have never met our son. Don’t get me wrong, Noah’s great. In fact I often thank God for creating our boy with so much joy. If you’ve been following our story for very long you’ve no doubt seen countless pictures of Noah’s contagious smile. That doesn’t have anything to do with Noah being born with Down syndrome, it’s just his personality. He’s outgoing. Just like his daddy. But even with all of the cuteness, some days he just ain’t feeling it. Like today for instance. 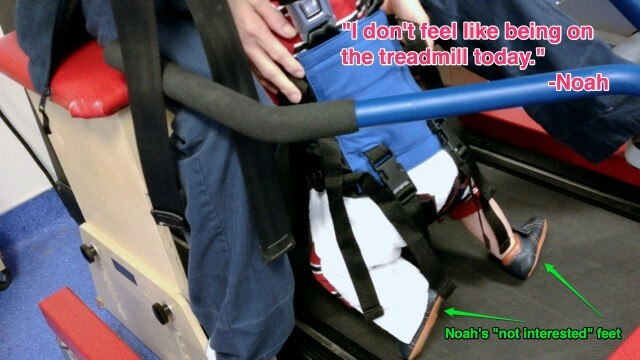 Typically Noah does great when his physical therapist helps him learn to walk using the treadmill. In fact he even does it with a smile (and I’m sure even a hug if he wasn’t strapped into his awesome treadmill outfit!) But as you can see in todays video and pictures, he just wasn’t feeling it today. In this video Noah’s just a little over 10 months old, and you can easily see he’s knows what it means to be stubborn. Normally when Noah gets on the treadmill he puts one foot in front of the other and crushes it, but not today. Today he decided to relax his legs and do nothing. No matter how loud we cheered, or how many funny faces we made, Noah just wasn’t feeling it today. Some Days You Just Don’t Feel It. And It’s Ok.
As parents we need to let our children know it’s ok to just not feel it some days. That it’s ok to have off days; us adults certainly have plenty of them. As Noah grows up I want him to know that it’s ok to have days like this, heck, if he were a little older I’d probably just skipped physical therapy all together today and opted for a daddy-son movie date instead! Winning! There’s a fine line here, because I also want Noah to learn the importance of being responsible and doing the things that are asked of him; especially by trusted adults who have authority over him (teachers, therapists, coaches, youth pastors, family members, etc.) As he gets older we’ll continue to help him understand what that means and how to off days without being disrespectful. How do you teach your children to balance off days and not being disrespectful? Have you given your children permission to have off days? Do they know it’s ok. This is a great post. As someone who endured lots of physical therapy as a kid, it’s so important you guys give Noah ‘permission’ to have a day off without stressing over the cost, the drive time, the frustration of it all. You’re amazing parents. This part made me laugh: Whoever said that all children with Down syndrome are angels that obey every wish of their parents (or their physical therapist) while smiling and hugging them all at the same time, clearly have never met our son. Fairly often people will tell me that they can tell I am such a sweet person just by looking at me (ie noticing my Cerebral Palsy) but that’s not me. I’m opinionated, stubborn and have a very dry sense of humor. None of these things fit in the “Handicapped people are always so sweet box”. That, I’ve learned is ok too. That is something I am constantly educating people on. My daughter (who has Down Syndrome) is extrememely hard headed and strong willed. In the right situation these things are great. But during therapy, its like a fight of wills…. and she usually wins. I wouldn’t want her any other way because I know she can stand up for herself. But she is not one of those “kids with Down Syndrome are always so sweet and loving” kind of kids. She is a kid with her own personality. Much like mine, and we always get our way. It is OK for all kids to have an off day. We have them as adults too. Today is my little guy’s Birthday and when we woke him up and started singing “Happy Birthday” he looked at us with his angry face and said “Please Stop!” He has cheered up since then, but everybody deserves their off moment. How old is Josh by the way? I srsly love you, Noah & your posts! Yes, I allow off days. My 9 yr old has endured OT, PT, therapeutic horseback riding (which is AWESOME btw), karate (another great thing we got him into), social skills play group, tutoring, and now speech has been added in to the mix every week for the past three yrs. Add in school, mom errands, homework, studying for spelling, doctor visits, evaluations, etc, etc, etc. Let me tell ya, he deserves his off days!!! Once or twice a year we go do something that he wants to do & we skip a school day to do it. We have actually taken a break from karate, social skill play group and horseback riding because three yrs worth (and an hour & two hour car trips to get there and back) had gotten extremely tiresome for both him and I. So right now those have been put on the back burner. It is so easy to burn yourself (and your little one) out, esp when you are told do all of these things for the best of your child. It is all give and take & moderation. Running around every day of the week burns you out quickly. It took me 2-3 yrs to figure that out but at the time all I was thinking was get in as much recommended therapy and activities as the doctors/specialists/therapists say… We are human, sometimes as a parent we forget that! I am interested in karate for my son (18mos). When did you start? Did it require any modifications? My older son is 3, and we thought about signing him up in a year or so, and thought it might be a good thing they could do together. My son is 9 now, he started at 6. The owner made an exception in our case as he usually will not accept a child until they are 7. My son is actually autistic but has hypotonia, motor skill deficits, dysgraphia, sensory integration dysfunction, speech and language deficits and a bunch of other deficits. My son was the only special needs child they had ever had in the 15+ yrs he had been teaching. The class was less than 15 kids, all 12 – 15 and I think that made a HUGE difference. Small class, older children who were extremely tolerant and patient. The instructors and class were absolutely amazing with my son! It was great for social skills, confidence, balance, endurance, discipline, coordination, etc, etc. They also started something called Verbal Judo (helps deal with bully’s, how to handle them, what to say, how to deflect them verbally, etc) when kids started bullying my son in school! Will be putting him back in either this summer or fall. I would call around and ask what age they start. Then go around and meet the senior master and talk to him about your child. You will know after meeting him if it will be a good fit for your child. Thanks so much for this information! The articles were very good, and I appreciate you telling your own experience. It sounds like it’s a very rewarding thing. When we’re already in the realm of therapies two and three times a week, adding in “one more thing” can seem a little overwhelming. But I think it’s probably worth it, especially a few years down the road. Thanks! It was great especially considering my son does not do well with team sports. This & horseback riding were sports he could do at an individual pace with other children that offered good exercise and therapeutic effects. I highly recommend both activities! At that time we were doing activities 5 days per week. We really burnt ourselves out! You could try a week or so at a karate/martial arts summer camp. Most places offer some type of summer camp option. Just one of those days. 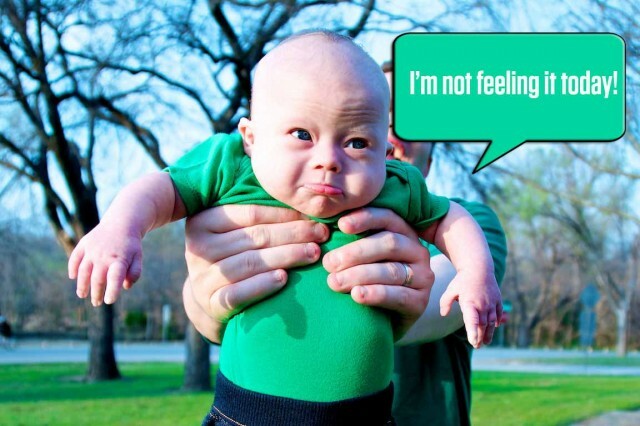 If Noah is not in the mood, well Dad you cannot make him do it. Don’t we all have those days. I sure do. Usually if you start with them extremely young, children learn that they can ask for choices instead of just throwing a fit. And that little tiny bit of control over their own environment can make all the difference! breakthroughs. James will finally get it when we’re back on track. to handle those a bit differently, like you said. We used to call them “mental health days”. I often find myself saying to myself and others…you can’t make him do anything…you can only encourage him. And I think this is true for all children and all adults. I think we just notice it more with our children with Down Syndrome because we are constantly focused on trying the next new thing. My son is by far the most stubborn child I know. He comes by it naturally as his father and I are also very stubborn. I consider this to be an outstanding characteristic and I credit that stubborness for his incredible acheivements. I love your blog and your facebook page. It brightens my day, every single day. First I want to say that when my kids arent’ in the mood to walk the just sit down not caring where we are and refuse to move….It’s what I affectionaltely refer to as the “Down Syndrome Plop”. 🙂 I always use the phrase “pick your battles wisely”. It’s not important that any child have perfect days all the time. When mykids just aren’t in the mood we have discussed appropriate ways of dealing with this. I started early on even when they weren’t able to communicate well and now my kids (ages 4 and 5 – both have DS) will tell me when they need a break and even try to negotiate the number of times I want them do something. Although they still have their meltdown moments, the full force meltdown is less frequent. Right now it’s how many more sight words my daughter should pratice or how many more books we should read. Balancing when to push and when to give in is always hard….but knowing that it needs to be done is good for both parent and child! Our Seth is very strong-willed. He’s been known to throw a spoon or two. It’s so funny to see this because like you said, people always think that children with DS are always just the happiest and most loving babies/children there is, and although they probably are the most loving and happiest on their good days, Heaven knows they have their bad days and stubborn days. When my grandson Tyler would have physical therapy his teacher started referring to those days as him being on Tyler time, when Tyler’s ready to do it then he will and not a second sooner lol. Gotta love it. Had to laugh – my daughter Lucia, 4 months old, decided today to fall asleep, deeply deeply asleep, right in the middle of her OT session this morning. Our therapist just laughed – “when she doesn’t want to exercise, she seriously doesn’t want to exercise!” I thought back to this blog post immediately – today was clearly just one of those days. This is good to read, I think it’s good to spread awareness that kids with DS can be little terrors like any other kids, there is nothing I hate more than when you tell someone your child has DS and they come back with that line about them all being loving little angels. Most of the time my Anya is an utterly charming and hilarious little sweetheart but certainly NOT all the time and I’ve met lots of kids and adults with DS that are not outgoing or funny. It’s just annoying, it’s a nice stereotype to be painted with I guess but it’s a stereotype all the same and means they are not seeing the person and only seeing the disability, sorry, winds me up. I liked your mention of this in your DS day video too, well done. We all have days where we are “just not feeling it” and one to two year olds tend to have them more. I think you have to balance it all. It is also beneficial for Noah to understand that you will honor his opinion and hear his voice at times. As much as we would like to at times as parents, we can not control our children each and every moment. That is what allows each child to be unique.